A great article published on Wharton University’s knowledge blog. It explores how lean and innovation can complement each other to make companies successful. In my personal experience in auto manufacturing, it was almost a given that the first months of production of a new product required the hiring of additional personnel to address inefficiencies that could not be eliminated prior to launch. Great products were brought to market on time but with a lot of waste (time and materials) that still needed to be eliminated. 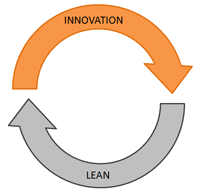 The Lean cycle, after the innovation cycle ensured that no matter what the company brought to market it would quickly become not only a better product, but also a cheaper one to make. In the course of the process innovation sometimes brings great inefficiencies with it, especially if being first to market makes a company rush the implementation of a product. In general there isn’t enough time to work out all the problems in the design and related manufacturing processes. In order to win the innovation game you can’t afford infinite time to refine prior to implementation. Companies, in the post implementation phase, require a culture of continuous improvement and waste elimination… this culture is called Lean. The Lean Innovation (LI) cycle is a good way to guarantee success since it does not require the innovation phase to deliver perfection and thus the innovators can quickly focus on the next great invention. Posted on Thursday, January 21, 2010 by George R.
To me this sounds like a cycle of rework. Of course there will always be rework to be done, but from my research (including the article you posted above) I look upon Lean Innovation as the attempt to start eliminating waste ans optimizing the process using lean principles in the earlier stages and not just starting lean after product launch. Sebastian, my apologies for not releasing your post earlier. I hadn’t engaged my blog in some time. To a degree you are right, however if you consider that ‘absolute Lean’ (perhaps I’m coining a new phrase here) is only achieved through a perpetual engagement of continuous improvement, then it’s also a given that no matter how much effort is placed at the front end of product development there will always be room for improvement after the product is released for production.